Truckmount Steam Clean, LLC offers a range of carpet cleaning, color restoration, and odor treatment solutions for the people of San Antonio and surrounding areas. We also offer water extraction and removal for both residential and commercial clients throughout the service area, with 24-hour answering service. Count on our team of professional carpet cleaners to keep your home, office, or other place of business looking and smelling great. Soul Cabrera the owner of Truckmount Steam Clean LLC , has been cleaning carpets for over 20 years, his experience and knowledge has made him one the best carpet cleaning companies in San Antonio. Today, we make a difference in the lives of our clients by delivering high quality carpet cleaning, water removal, pet treatments, and much much more. Our innovative custom built truckmount systems will deliver the best deep cleaning method for the most professional results. Our highly trained Master Technicians ensure detailed attention when evaluating your carpet, and will answer any questions you may have. Our Certified Water Technician is on standby to handle all water extraction emergencies, your calls will not be missed with our 24 hour answering service. Our customers trust us for a wide range of reasons. First, we're insured, uniformed, and our trucks are loaded with the latest technology. As a small, independent company, we can offer lower prices and more personalized service, including a guarantee that ensures if you aren't happy, we'll do it again free of charge. Every steam cleaning service includes a free spot treatment and deodorizers, and there are never any upcharges or upsells. Finally, our office delivers the best customer service whether you email, call or fax us. 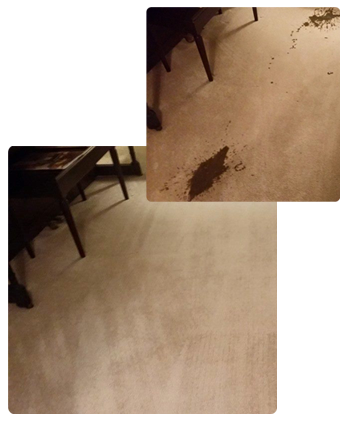 When you choose us you don't have to worry about your carpets not being done properly. Whether the result is held to your standard or the standard of a real estate company, we know exactly what needs to be done. We work with several real estate and property management companies to know what they expect from us and what we need to do for the carpet to pass their inspections. We not only stand behind our guarantee, but train our entire staff to uphold this standard. Our company has been built on customer satisfaction. Customer service is our first and foremost objective. Our vision is to be the preferred vendor for all of your carpet cleaning services.